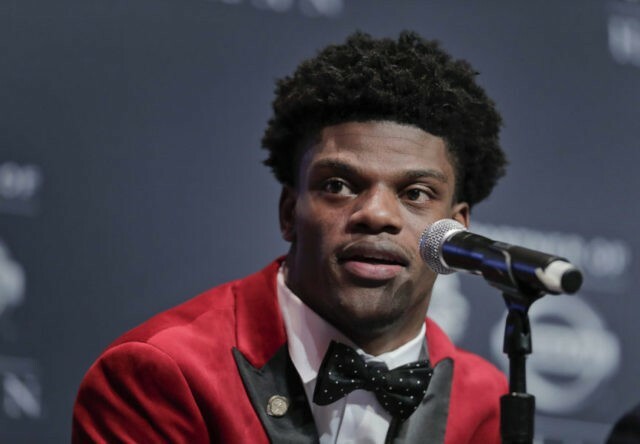 NEW YORK (AP) — Lamar Jackson is the first Louisville player to win the Heisman Trophy, beating out preseason favorite Deshaun Watson of Clemson despite some late-season struggles. The sensational sophomore quarterback leapt over a loaded field of Heisman Trophy contenders early in the season and by the time he slowed down nobody could catch him. The highest honor in college football was handed out Saturday night in New York. Baker Mayfield finished third and Oklahoma teammate and fellow finalist Dede Westbrook was fourth. Michigan’s Jabrill Peppers was fifth. Jackson, at 19 years, 347 days, is the youngest Heisman winner ever.